The Trade Facilitation Agreement adopted by the WTO member countries at the Bali Ministerial Conference in December 2013 highlights the importance of trade facilitation for international trade and the global economy. 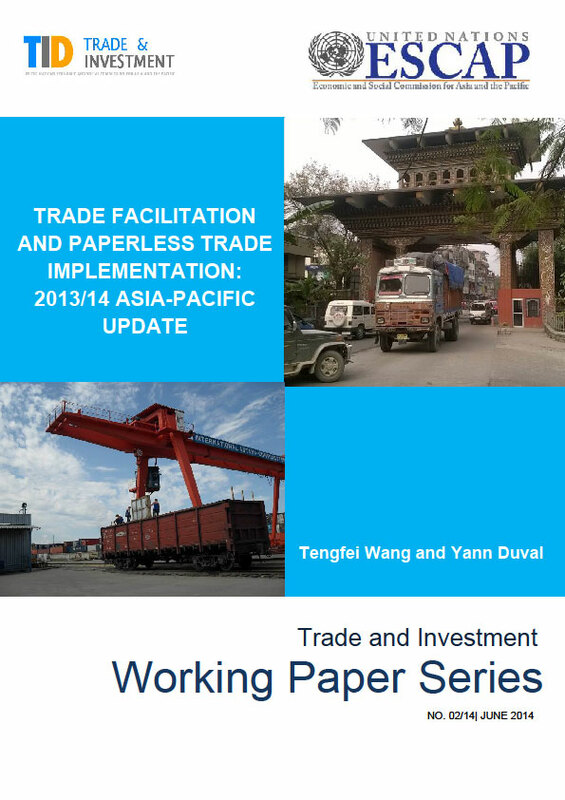 This paper provides a unique set of data on the progress made by 29 countries in Asia and the Pacific in implementing various trade facilitation and paperless trade measures in 2013/14, as well as estimates of the benefits from moving forward with implementation. An important finding is that most countries do not regularly assess or publish release times, pointing to the lack of effective national trade facilitation monitoring mechanisms. The study reveals that, at the regional level, automation and paperless trade, including establishment of national single window, were the key focus of trade facilitation reforms in 2013. Enabling cross-border paperless trade is identified as the most challenging task to further advance trade facilitation in Asia-Pacific, highlighting the need for timely conclusion of a regional arrangement to facilitate cross-border recognition and exchange of trade-related electronic data and documents, as currently being discussed by countries of the region under ESCAP Resolution 68/3. At the subregional level, East and Northeast Asia and ASEAN lead implementation of trade facilitation measures, followed by Central Asia (including the Russian Federation) and South Asia (SAARC). The empirical analysis included in the paper reveals that direct trade costs for containerized goods in the region, excluding international transport costs between seaports, amount to approximately US$ 159 billion annually and that full implementation of trade facilitation measures included in the survey could lower such costs by 20% on average, amounting to savings of at least US$ 31 billion every year. It also reveals that full implementation of trade facilitation measures in the 14 landlocked developing and/or least developed countries (LLDCs and/or LDCs) included in the study would enable these countries to collectively reduce direct trade costs for containerized goods by US$ 3 billion per annum.